Dying Stars Write Their Own Swan Songs : The Two-Way Astronomy professor Alicia Soderberg is turning the final moments of stars into music. In doing so, she's learning just how different the supernova explosions can be. When stars explode, they release many different types of light. 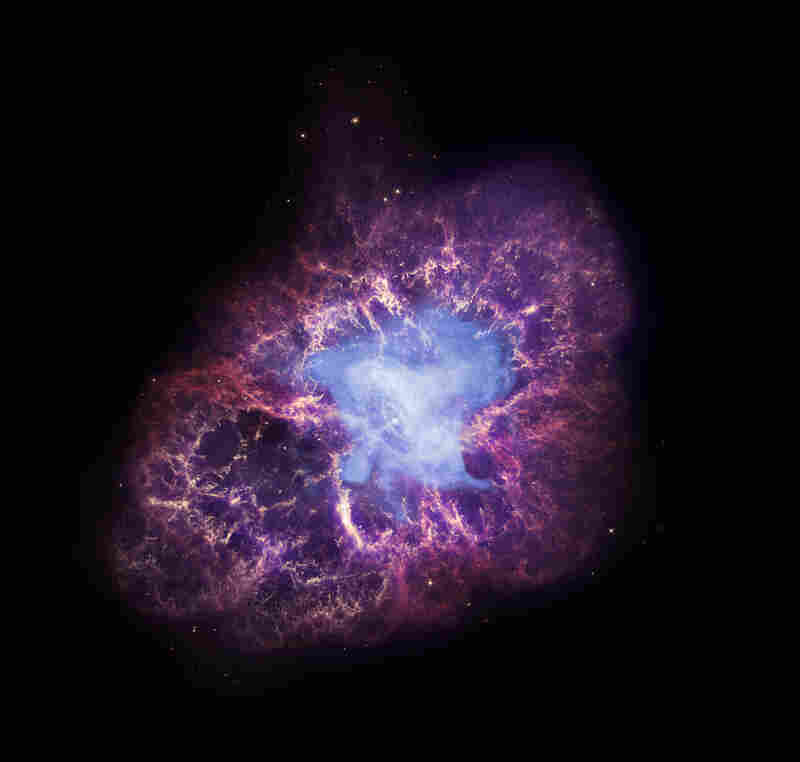 This image of the Crab Nebula combines X-rays data in (blue), optical images from Hubble (red and yellow) and infrared data (purple). As a star's shell explodes outward, its core squeezes inward. The result can be a black hole or neutron star. 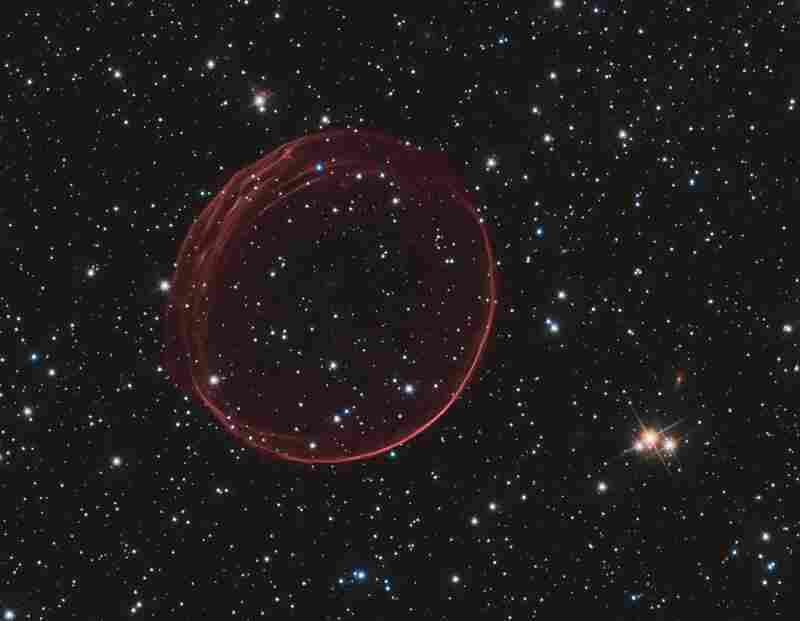 This highly distorted supernova remnant, called W49B, may contain the most recent black hole formed in the Milky Way galaxy. A sphere of gas floats in the depths of space. Called SNR 0509-67.5, the bubble is the visible remains of a powerful stellar explosion in the Large Magellanic Cloud, a small galaxy about 160,000 light-years from Earth. 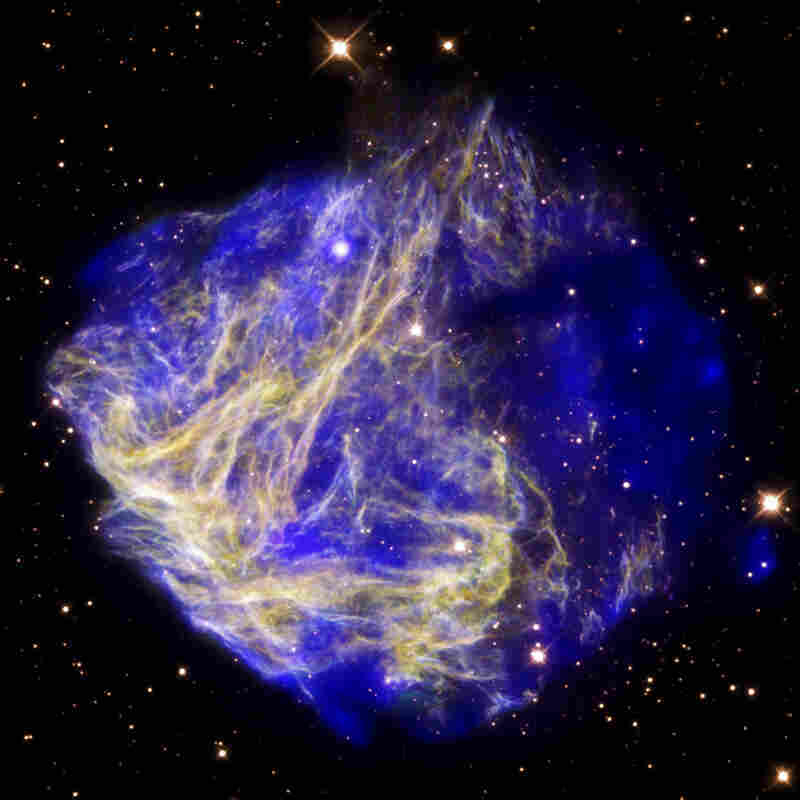 This supernova remnant, known as N49, is also located in the Large Magellanic Cloud. The star that created it exploded some 5,000 years ago. This composite image shows new details of the aftermath of a massive star that exploded. The explosion itself would have been visible from Earth over 1,000 years ago. Alicia Soderberg studies the death of stars. 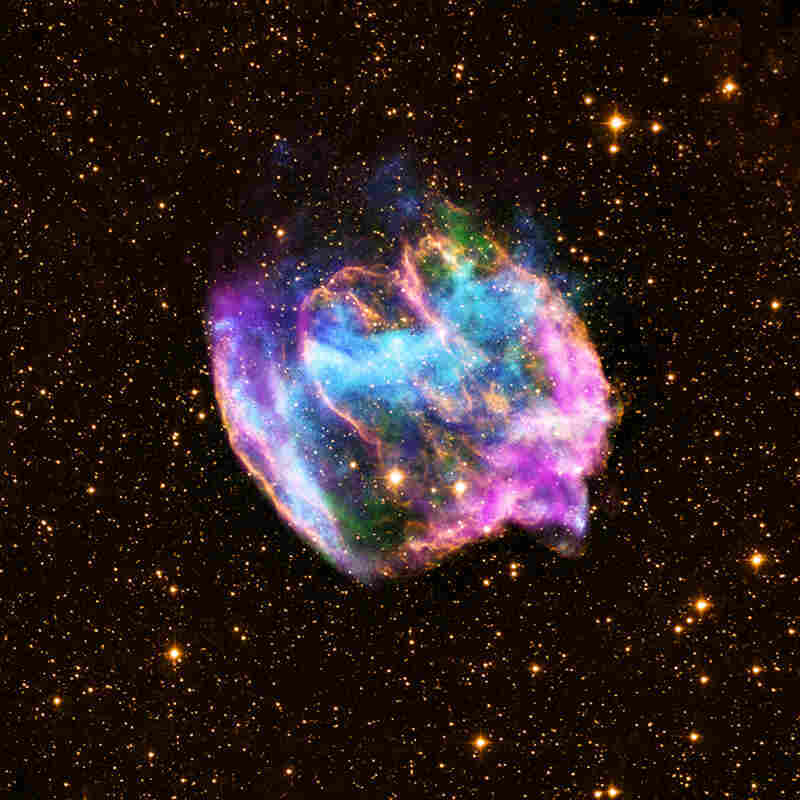 Often, these final moments come as violent explosions known as supernovae. They're spectacular events, but catching one as it unfolds can be tricky. "You have to be in the right place at the right time, and often we're not," says the professor in Harvard's astronomy department. "So all you can do is do a stellar autopsy and go back and try to pick up the pieces and try to figure out what happened." A few years ago, Soderberg met a graduate student named Wanda Diaz-Merced. Diaz-Merced lost her eyesight years ago, so she studies astronomy not with sight, but with sound. "I have been able to listen to meteors passing through the atmosphere, solar storms, that is just to give you a gist," she says. The data from stars, comets and planets all sound different. "Every sound I listen from the skies, it has its own voice." "The Radio gets the drums, the X-ray gets the harpsichord, and everything in between gets a different instrument, like a violin or a flute," Soderberg says. She presented the first of these songs this week at the American Astronomical Society annual meeting in National Harbor, Md. When Soderberg listens to these songs, she started to hear things. Things she hadn't noticed when she looked at the data. 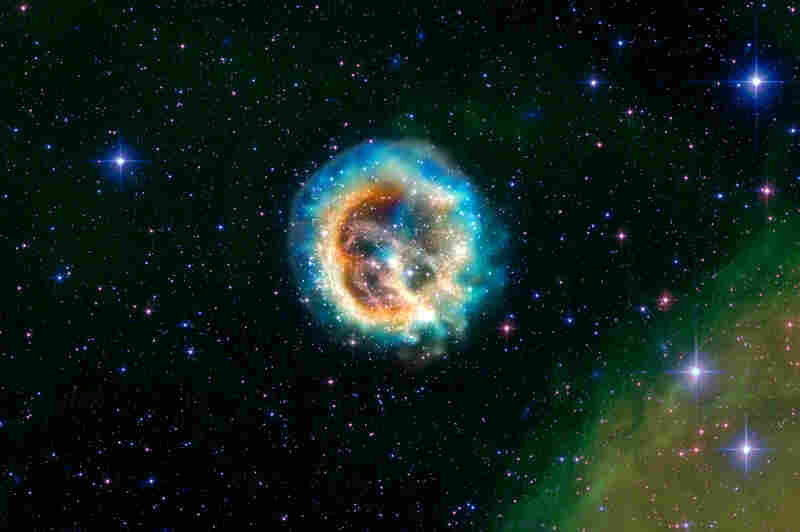 Each supernova sounds different, because each star dies in a different way. "Stars can [die] by running into each other for example, like a car crash, or they can die by just running out of fuel," she says. "A lot of stars will do interesting things before they die like pulsate or spin or get overheated." The songs map the story of the star as it explodes and expands and cools into a cloud of gas and dust. But these aren't only deaths. These supernova explosions release enormous quantities of elements like carbon, oxygen, nitrogen. Elements we need; elements we're made of. "I mean, supernovae fertilize the universe," Soderberg says. "We wouldn't be here if it wasn't for supernovae."